The 'UML' representation was prepared in response to your suggestion @kcoyle - but it is just a convenient graphical rendering and is non-normative (as is the rest of clause 5). 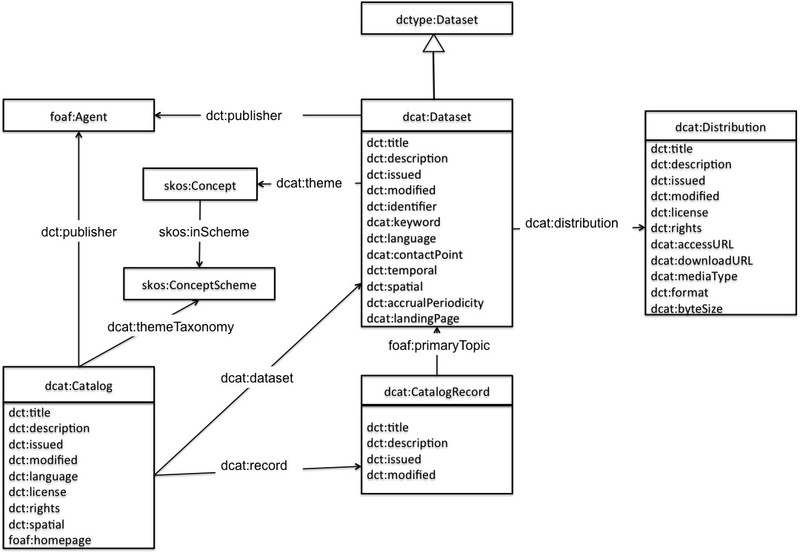 Regarding the alignment of properties to classes, DCAT is axiomatized using a mixed model. Some but not all of the DCAT properties have RDFS domains and ranges. However, DCAT makes extensive use of Dublin Core, and there are no axioms in DC's RDF formalization to tie any of those to DCAT classes. We discussed this agreed that the statements in the Recommendation document are definitive, where we say "The following properties are recommended for use on this class: ..." so I just reflected these up into the diagram. I might have missed a few, but was guided initially by [this diagram from DCAT-2014](https://www.w3.org/TR/2014/REC-vocab-dcat-20140116/dcat-model.jpg). Previous message: kcoyle via GitHub: "Re: [dxwg] Change domain or create superclass of dcat:Distribution"